The Falling Nightsmade me audibly yelp in the middle of the night. My roommates, from the living room, asked me what happened; they knew I was playing a horror game. “I don’t know!” was all I could respond — I really didn't know. The Falling Nights was throwing the most bizarre scares on my plate within the first thirty minutes of gameplay. For a genre in which it can be incredibly difficult to innovate, I was pleasantly surprised by some of the choices of The Falling Nights. Some were good; others, questionable. But, there are twinkles of inspiration amid the flaws. This title is of the Amnesia-style horror genre: you explore a sinister environment, picking up notes left behind that convey the backstory and plot. 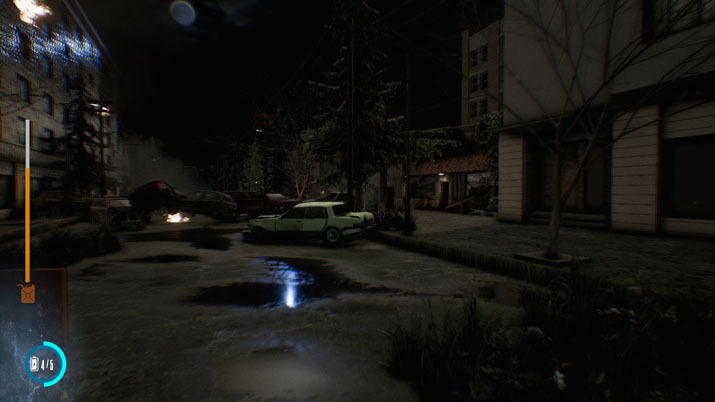 Played from the first-person perspective, The Falling Nights places the player in the role of Jake Lawrence, a man desperate to find his daughter after an accident occurs in the City of Ys. An expository cutscene sets up the plot, unfortunately, however, the lackluster writing, dated graphics, and unenthused voice acting don't do a lot to earn a player’s investment. The script feels like a decent English translation, with a few oddities here and there that almost add to the game’s surreal nature. The voice work is on par with PC cult classic Metro 2033, with the occasional dip in quality. It’s passable, especially if you don’t go in expecting any sort of AAA work. Once started, you notice issues immediately. Jake is unable to walk around without his flashlight held up in front of him. When he stands still, he lets the flashlight fall to his side. Upon resuming movement, the flashlight arm pops up almost instantly. This bizarre jerking motion is a distraction that manages to mar a lot of the game’s visual design. It's unnatural and sometimes even results in Jake flinging the flashlight down and hitting walls and railings, creating clanking sounds that put fear into my heart (until I realized the cause). The Falling Nights ran pretty poorly on my beefy system you may need to tweak settings below your liking to get a good performance. There are also visual quirks, but, as an indie-developed title, the odd, floating trash-can-fire can be forgiven. These issues aside, The Falling Nights wants to scare you — and succeeds in doing so. 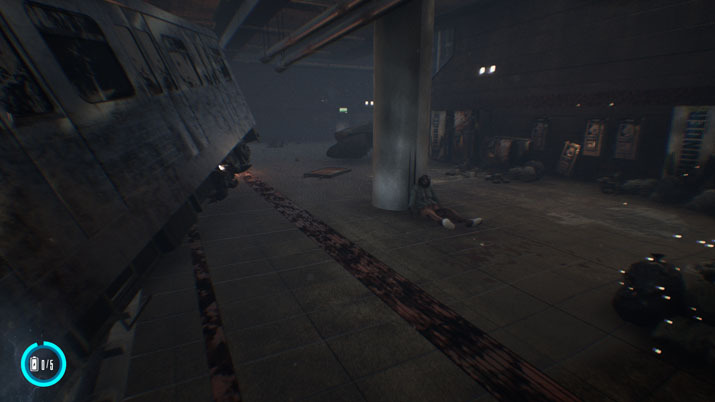 After a train crash, Jake has to navigate a desolate subway station. Footprints on walls foreshadow creepy crawlers that most certainly got under my skin. The creepy audio design is also random enough to have players questioning every sound they hear. Distant clanking sounds and footsteps kept me leaning away from the screen in preparation of jump scare. One of my encounters with the creatures of this game occurred after trying to solve a short circuit breaker. A voice uttered “look behind you.” I ignored this request for as long as I could before turning and being assaulted by a creature crawling towards me in the ceiling. My death was instant: there doesn't seem to be any damage system in this game, and this will most certainly frustrate many players. But, boy, did it startle me. And had I not been so petrified, I could’ve probably escaped with my life... I quite liked that scare. When my game reloaded, and I was in the same room with the same puzzle yet to be solved, I felt much more prepared. I called my friends over to see what had killed me. But, although the voice did repeat, there was no monster. No encounter occurred. It's unclear to me if these encounters are triggered by environmental cues, or simply randomized. But, more titles should do this sort of thing: it keeps you guessing and you never quite feel safe. Unfortunately, this system seems to be a double edged sword. Though it does provide additional thrills, there were moments where a monster would pop up and attack me in an area I've been in several times. A creepy figure also appeared before me for a split-second, accompanied by a jolting sound effect, for seemingly no reason. With instant death as my consequence and virtually no time to react or defend myself, I grew incredibly annoyed with these cheap scares. The encounters are so bombastic and odd, it's hard to say if they were on purpose, or if it was a mistake on the part of the developers. Rarely is the reason behind these moments communicated to the player — it just happens at complete random. The Falling Nights is scary, but I'm not entirely convinced if it's the result of careful design, or a happy accident. The environments are eerie, the sounds downright frightening, and the scares most certainly unexpected. But these elements don't always work in tandem to create a compelling and accessible game experience. Sometimes, an eerie sound cue would play as if I had just seen something scary, but all I had done was pick up a battery. Every note the player finds is comically stained by a coffee mug and blood spatter, as if every denizen was drinking a cup of joe before meeting their demise. It's also unclear why these people would write these notes during a crisis scenario, as they seem entirely for the purpose of conveying information to the player. These inconsistencies create a messy experience that doesn't hold up, despite the decent scares. Little of the game’s mechanics are explained, and several prompts are riddled with grammatical errors. It's clear to me that the studio, Delusion Arts Entertainment, was passionate about making this game; they claim it took four years of development to make. The music was done in-house, and from what I can gather, so was the voice acting. This feels like an incredibly ambitious title for a studio just starting to find its bearings. I can't knock them for shooting for the moon on this one, but it feels to me that they'll have to settle for landing amongst the not-so-bright stars. Inconsistent design choices, cheap scares, and overall graphical muddiness.